How often do you look at your roof? If you're like many homeowners, you run in and out of the house, shuttle the kids back and forth, and glance up at the roofline only occasionally as you back out of the driveway. Following are some signs to look for outside your home when determining if a roof repair or replacement is needed on your home. Missing granules: Normally a certain number of granules will be loose, especially after application; on aging shingles, this indicates the need for replacement. Don't wait until water is unexpectedly pouring into your home by way of a leaky roof. Start protecting your home by using some simple observation skills. 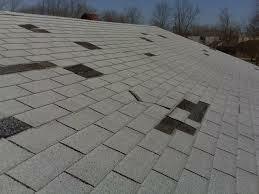 If you find problems, it doesn't necessarily mean you need to replace your roof. Many repairs can be made before a major rebuild is necessary. 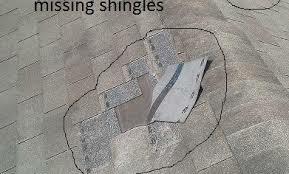 Do you have missing shingles that need to replaced? Call us and we will take care of it for you. Better to fix the issue now then to have pay more later. When Shingles go missing, the biggest risk is that they leave the nail holes also which allows water to begin to go into the attic decking. So call us at 817 381 6855 today. Designed for discriminating homeowners who demand outstanding performance, classic detailing, and a traditional appeal in a basic 3-tab shingle. For just pennies-a-day more, you can enjoy our thickest, longest-lasting Timberline® Prestique® High Definition® shingle—and increase your resale value, too! Features GAF-Elk’s patented “High Definition” color blends and enhanced shadow effect. The TruSlate™ system can make your dream of owning ­a genuine slate roof a reality. It features real hand-split quarried slate, not some synthetic imitation. Most important, TruSlate is often comparable in price to imitation slate. Royal Sovereign® shingles combine a simple, timeless beauty with GAF’s well-known quality — making it our most popular 3-tab shingle. 30-year architectural shingles, Timberline® Prestique® 40 shingles feature GAF-Elk’s patented “High Definition” color blends and enhanced shadow effect. GAF-Elk's top-of-the-line shingle—yet it's only a fraction of the cost of expensive slate or wood shakes. With a genuine slate-like appearance and Super-Heavyweight “Plus” construction, Camelot® may be the finest asphalt shingle ever made! Get great value and performance in a distinctive wood shake look. Include GAF-Elk's patented High Definition® color blends. The ultimate choice for a rugged wood shake look. Carefully sculpted shingle tabs combined with a subtle “shadow effect” result in a sophisticated yet rugged design. Safer than wood shakes because they are UL Class A fire rated. For those who want less contrast in their roof, the classic Timberline® Natural Shadow™ shingle is the right choice. Adds a subtle, even-toned look with the warmth of wood to your roof. Get the look and charm of hand- crafted slate. Unique design creates a timeless, turn-of-the-century look - great for historic properties, especially Victorians, or even charming cottages. For a dramatic statement, choose the rich depth and dimension of Timberline® Prestique® Grandé® 40 shingles. They're 47% larger than standard architectural shingles for a more genuine wood shake look. Patented, extra-large shingle with unique design helps create a dramatic visual impact for prestigious homes and properties. Safer than wood shakes because they are UL Class A fire rated. The revolutionary Cool Color Shingles combine the visual impact of Timberline® Prestique® 40 shingles with potential energy savings. Offered in a palette of rich, organic colors. Meets initial ENERGY STAR requirements. A stately accent for the finest homes and properties. Massive, extra-thick tabs and specially-blended color palette create the look of real slate shingles. Timberline® ArmorShield™II impact-resistant shingles with High Definition® color blends provide a beautiful looking roof with the extra protection that a UL 2218 Class IV rating can provide. May even qualify for insurance discounts! The classic look of random-cut European slate. Random-cut design results in a timeless, turn-of-the century look—especially great for historic properties, Victorians, or even charming cottages. The look of slate at a fraction of the cost. Patented, extra-large shingle with bold shadow lines and tapered cut-outs. Especially great for historic properties, Victorians, or even charming cottages. Please see our starting price chart for your city, if your city is not on this list still call us we serve the entire DFW Area.